Thank you for considering making a donation to Save Tootgarook Swamp. Save Tootgarook Swamp relies entirely on small donations from the public and members to operate. We receive no regular government funding, though do apply for suitable government grants. Your generous donation will help protect the Tootgarook swamp for a better, brighter future, and inform, connect and empower the community to take up the voice of Tootgarook Swamp, the "land of the growling frog". Your donation will help to energise the campaign to Save, Protect and Rezone the Tootgarook swamp. Save Tootgarook Swamp Donation Form. Save Tootgarook Swamp keeps its internal costs down with a small team of dedicated volunteers. 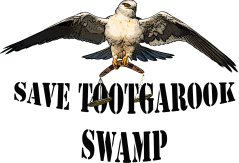 All donations go to our campaign activities, paid media and designing interactive web experiences to allow the unheard voice of the swamp be heard. Under taxation current status, donations to Save Tootgarook Swamp are not eligible as a deductible gift recipient. Nowadays you can buy almost anything online, our online stores front at Red Bubble or at Zazzle have some fantastic gift ideas for your loved ones or even just yourself. With all proceeds going back to Save Tootgarook Swamp. Tootgarook Wetland Ramsar Nomination Feasibility Study 2015, M. South, A. Costen, BMT WBM (pers. comm. Boon Wurrung community representative 2014).